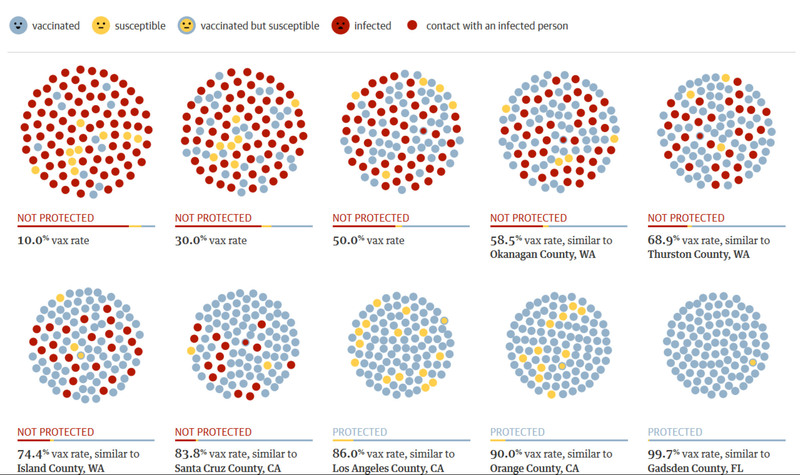 To help explain the concept of ‘herd immunity’, The Guardian Newspaper has produced a clever online simulator of measles spread. We comment on why this simulator is informative and how it also demonstrates chance effects in the spread of infectious diseases. Then we take the opportunity to explain why NZ should be doing more to wipe out diseases like measles. Check out this very clever simulator from The Guardian US Interactive Team. Press the “run simulation again” button a few times and see how the communities with relatively high vaccine coverage will tend to avoid outbreaks – the incoming infected case (a flying red dot) will not trigger other cases. You can even see that sometimes a community with 80% coverage will be protected when a community at 90% will not – that’s the effect of chance. For a community to be really safe from a measles outbreak it pays to have a very high level of coverage to exceed “herd immunity” – like the 95% plus level in Gadsden County, Florida (the cluster of dots in the lower right of the simulation). “Herd immunity” is defined as the level of immunity in a population when introduction will typically not lead to spread of disease. As measles is one of the most infectious disease known, it is generally necessary for a community to reach vaccination coverage levels of 95% to achieve herd immunity (1). But for other less infectious diseases, like polio and mumps, lower coverage may be sufficient to protect a population from spread of disease. The herd immunity issue is why health authorities may encourage people to be vaccinated both to protect themselves and to help protect others. Sometimes those “others” might even be a younger sister or brother. Sometimes it will be a highly vulnerable child who could die from measles e.g., a child with cancer who is on chemotherapy which compromises their immune system. All New Zealanders should also be mindful of reducing readily preventable costs to the health system from conditions like measles hospitalisations. It is also important to remember that the vaccines in the childhood immunisation schedule are all for diseases that can have serious consequences (2). Measles for example is the most common vaccine-preventable cause of death for children internationally. Complications (otitis media, pneumonia, diarrhoea) occur in 1% to 10% of cases. Encephalitis which affects the brain and sometimes causing brain damage, occurs in around 1 per 1000 cases of measles. So how is NZ doing in preventing diseases like measles? A few years ago some of us published a paper celebrating NZ’s elimination of poliomyelitis (on the 50th anniversary of this impressive achievement) (3). We also mentioned NZ’s other successes of eliminating brucellosis and hydatids, and also the elimination of an imported potential disease vector, the southern saltmarsh mosquito. But we noted that NZ has made inadequate progress in eliminating several other vaccine-preventable diseases compared to some other countries. These include measles, mumps, and rubella, which we considered priority candidates for elimination, and potentially also Hib disease and rotavirus infection. This is an important year for measles control in NZ. Seven out of 16 verification committees in the Western Pacific Region of the World Health Organization (including Australia, Mongolia, Republic of Korea, Cambodia, and Japan) have reported data showing they have achieved measles elimination (4). NZ is expected to apply this year for the same status. Potential barriers are the fact that vaccine coverage with the first dose of MMR vaccine has not reached 95% and the significantly lower coverage for Māori children (4). Fortunately NZ continues to make progress with control of vaccine preventable diseases in general. It has recently introduced new vaccines into the childhood immunisation schedule (rotavirus and pneumococcal vaccines). Immunisation coverage has improved in the last decade, but many children are still not reached. Full coverage at five years of age for the last reporting period (October to December 2015) was only 83.0% nationally (5). Also there was a gradient by ethnic group: 87.0% for NZ European; 85.2% for Asian; 80.6% for Māori, and 78.8% for Pacific (5). So it is not surprising that NZ continues to have outbreaks of diseases like measles (e.g., for 2014, the last year for published data there were: 19 measles outbreaks involving 243 cases; 37 non-outbreaks cases and 48 hospitalisations (6)). Clearly there remain opportunities to increase overall immunisation coverage – and to also close gaps to address inequalities in protection. We also need clear thinking on such matters as potentially prioritising immunisation promotion resources to communities that are likely to be at highest risk e.g., places like Auckland where incoming overseas cases might be more likely to trigger outbreaks than other areas. Similarly for prioritising high coverage in deprived communities and communities with high Māori and Pacific populations. Part of this enhanced focus could even be developing simulators like The Guardian one for NZ communities – so the public could see progress towards achieving the measles-free goal. Durrheim D, Crowcroft N, Strebel P: Measles–The epidemiology of elimination. Vaccine 2014 32:6880-6883. Ministry of Health: Immunisation Handbook 2014. Wellington: Ministry of Health, 2014. http://www.health.govt.nz/publication/immunisation-handbook-2014. Wilson N, Baker MG: Celebrating 50 years of polio elimination in New Zealand: but inadequate progress in eliminating other vaccine-preventable diseases. N Z Med J 2012, 125(1365):67-74. World Health Organization: Fourth Annual Meeting of the Regional Verification Commission for Measles Elimination in the Western Pacific, 24–27 March 2015, Macao Special Administrative Region of China: meeting report. Manila: WHO Regional Office for the Western Pacific; 2015. This entry was posted in Uncategorized and tagged elimination, herd immunity, immunisation, measles, role of chance, simulator, vaccines by Kate Sloane. Bookmark the permalink. Getting ongoing childhood immunisation rates high enough will only be part of the solution to eliminating measles outbreaks in NZ, at least until late this century. Seroprevalence survey results, MoH commissioned modelling, and ARPHS descriptive epidemiology from the last major outbreaks have identified that our most significant immunisation gap is now in the youth & young adult populations. This is where the recent NZ outbreaks (2011/12 & 2014) have propagated, spilling over to also infect children too young to be immunised. This is often, but not always, in a secondary school setting. Until NZ takes deliberate systematic well planned action to address the immunisation gap in this age group, elimination will remain a transitory achievement at best, and imported cases will continue to spark outbreaks, cause illness and complications, and stress our public, primary, and hospital sectors. Great point Richard. This age group has >10% susceptibility, compared to 99% for those who grew up in the pre-vaccine era. Measles elimination does not mean the end of local transmission. As long as there are small pockets of unimmunized children in NZ, new imported cases will spark local outbreaks. With sufficiently high coverage these outbreaks are no longer turning into sustained epidemics. Can we use the simulations to better define the risk pools; hopefully to communicate the message. And also to clarify the issue of putting resources into protecting adults, as opposed to ensuring that every child who enters adulthood has had two doses? Hi Richard. The 2009 MOH seroprevalence survey had >15 year olds at 95% or above. ie, people born before 1994 had greater protection than those born afterwards. What do you mean by, “our most significant immunisation gap is now in the youth & young adult populations.” They are well protected immunity wise. Can you post the study that shows that?